Burmese refugees living in the Bay Area are anxiously waiting for news from relatives while planning to help victims of the cyclone back home. "Oh, it's very sad," said Jean Gale of Daly City who is originally from Rangoon; one of the worst affected regions of Myanmar. "Just like we had Katrina here in America," said Gale. "Now, in Burma, we are having this." Gale said she has been calling back home for days but the phone lines are down. 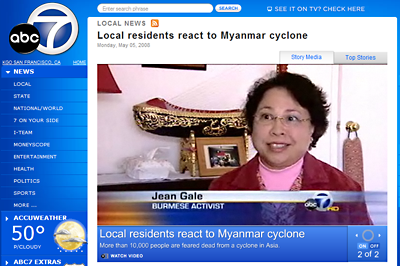 "It's frustrating," she said, noting that some Internet reports from Burma have described her home region as a war zone. "We hope for the best because in some townships it's in the news that 75 percent of the buildings have collapsed," said Gale.